The United States Constitution, drafted in 1787, established a new nation. It also introduced national citizenship, the eligibility for which would be determined by the United States Congress. The Naturalization Act of 1790 offered citizenship to “free white persons,” who had resided in the country for two years, and could prove they were of good character. Naturalization is the process through which someone becomes a citizen. 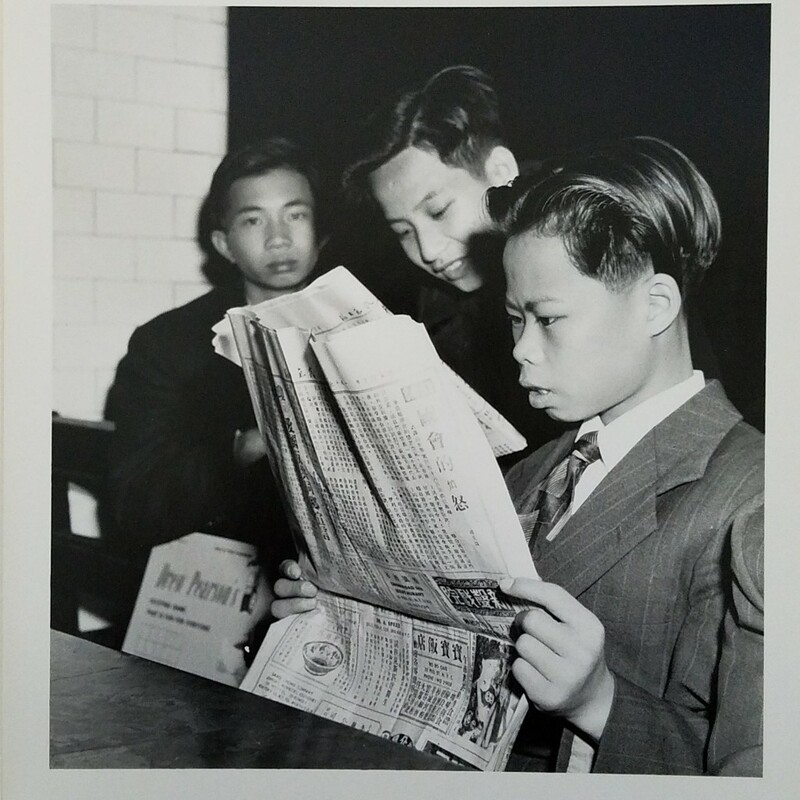 Although eligibility for United States Citizenship has changed repeatedly since 1790, three aspects of naturalization have remained the same: the act of petitioning or applying for citizenship, taking an oath of allegiance to the United States, and receiving a document that certifies citizenship. 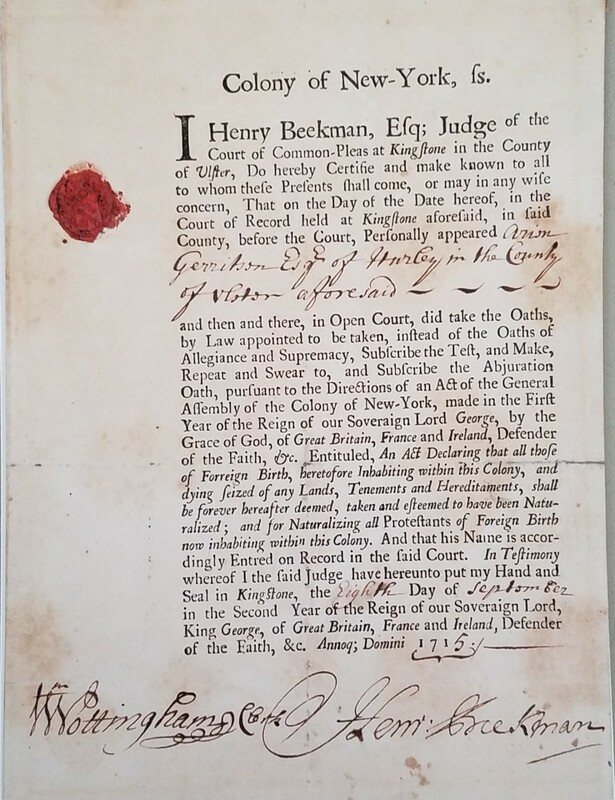 Henry Beekman, Esq, Judge of the Court of Common-Pleas at Kingstone in the County of Ulster, Do hereby Certifie and Make Known . . .
Before the ratification of the United States Constitution, there was no consistency in regard to citizenship in the thirteen colonies. Some residents were British citizens; others were not. Citizenship in a specific colony was also a possibility. King George I of England, who ascended to the throne in late 1714, directed the Colony of New York to pass a law in 1715 requiring all Protestants of foreign birth to abjure (renounce) citizenship in countries other than Britain. This document, signed and sealed by Judge Henry Beekman in Kingston, New York, certifies that Arien Gerritsen, a Dutch citizen, appeared before him and took the Oath of Abjuration. 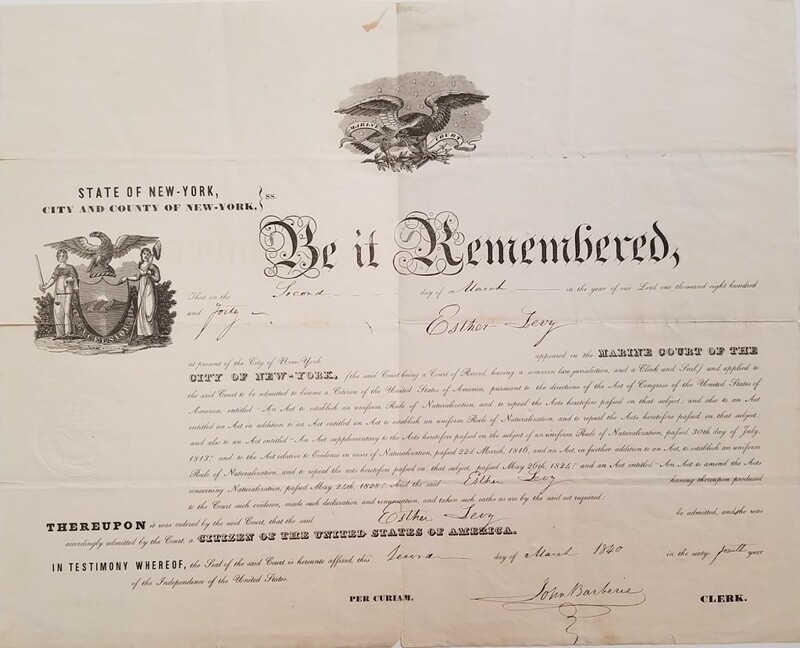 In this document Henry Astor, a butcher, petitions to become a citizen of the State of New York on behalf of himself and two others. 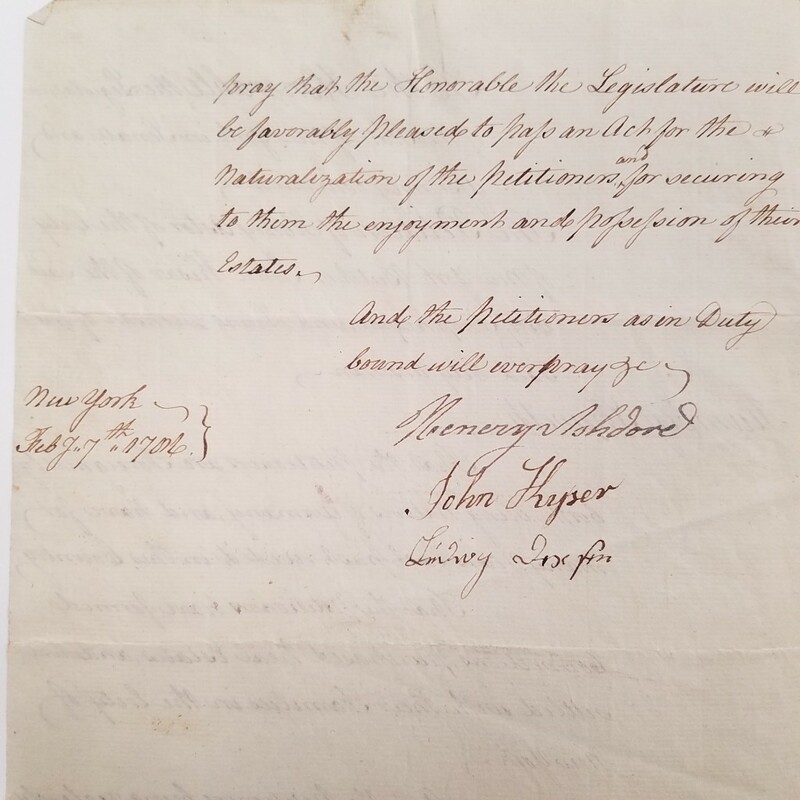 The petition states that all three are natives of Germany but have “for many last years past resided in this Country,” and have “formed connections, purchased Real Estate, and are settled with their Families in the City of New York.” Although national citizenship would not become a reality until 1790, the petitioners are “zealously attached to the Freedom and Independence of America.” Henry, originally Heinrich, signed his surname as “Ashdore,” a phonetic spelling of how his name would have been pronounced in the dialect of his hometown of Walldorf, in the German state of Baden-Württemberg. Henry Astor was the older brother of the more famous John Jacob Astor, who founded the American Fur Company in 1808 and, based on profits from that company and significant real estate investments, became the first multi-millionaire in the United States. He too emigrated from Germany. Laws governing eligibility for citizenship have changed repeatedly since the enactment of the Naturalization Act of 1790. 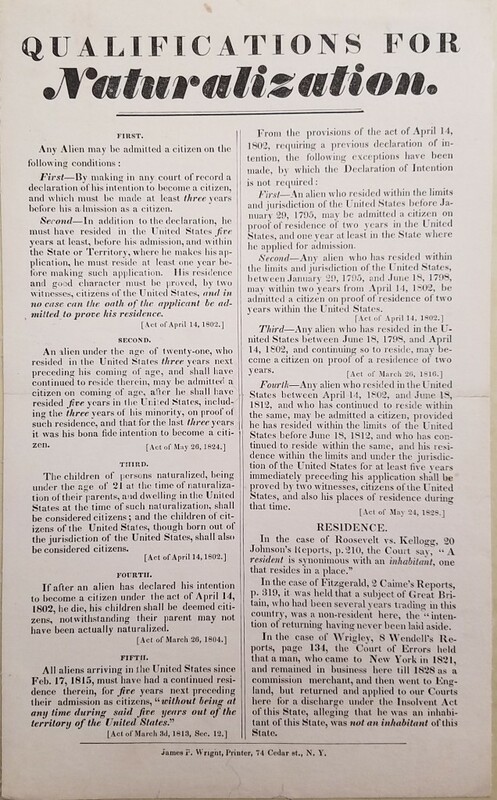 Summaries of six different laws, enacted between 1802 and 1828 were printed on the very clear and helpful handbill, Qualifications for Naturalization, in 1828. On the certificate verifying that Esther Levy was naturalized in 1840, there are numerous references to prior acts, and repeals of acts, governing naturalization. 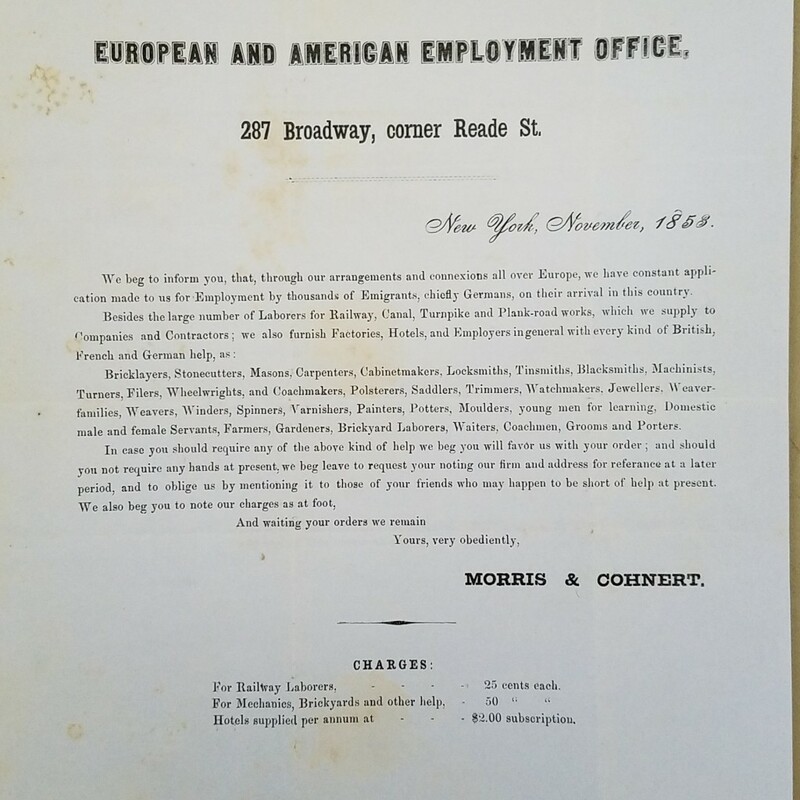 European and American Employment Office, 287 Broadway, corner Reade St.: New York, November, 1853: We Beg to Inform You, That, through Our Arrangements and Connexions All over Europe, We Have Constant Application Made to Us for Employment by Thousands of Emigrants, Chiefly Germans, on Their Arrival in this Country . . .
Employment agencies worked on commission, receiving fees from those hoping to immigrate to the United States and those who hired them. These agencies often targeted specific immigrant groups. Following the German Revolutions of 1848-1849, many people fled Germany; many more hoped to do the same. There was certainly plenty of available German labor. It is notable, however, that while reference is made to “connexions all over Europe” and the availability of “British, French and German help” there is no mention of Irish immigrants who, fleeing the Famine of 1847, arrived in New York in similarly high numbers as the Germans in the middle of the nineteenth century. 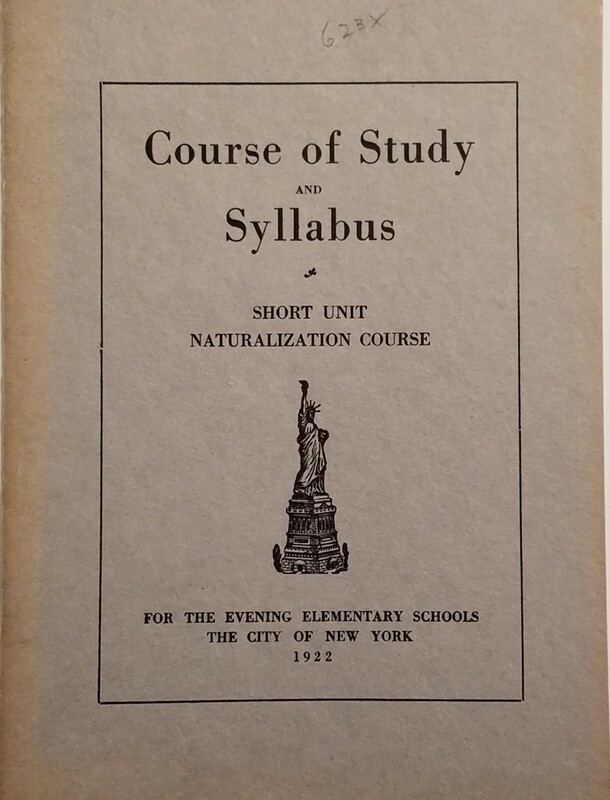 Among the many night classes that the Board of Education established in New York City in the 1920s were ones devoted to studying for the United States naturalization exam. For immigrants laboring long hours, these evening classes were key to their paths to citizenship. 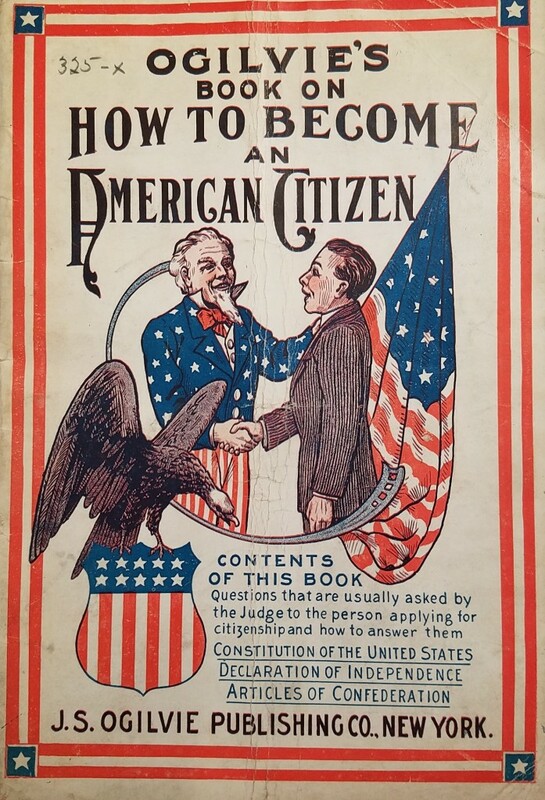 Looking much like an entertainment guide or vacation souvenir, this how-to book promises questions “that are usually asked by the Judge to the person applying for citizenship.” J.S. Ogilvie was a commercial publisher of dime novels and how-to books, including Fighting Bill, Sheriff of Silver Creek; Josie the Little Madcap; and One Hundred Prize Dinners. Considering the number of immigrants who had arrived in the United States in the late nineteenth and early twentieth centuries, this book was a quick and easy sale for J.S. Ogilvie. Erika Stone emigrated from Germany to New York City in 1936. She studied photography with both Berenice Abbott and George Tice at the New School for Social Research and has had a long career as a commercial photographer. 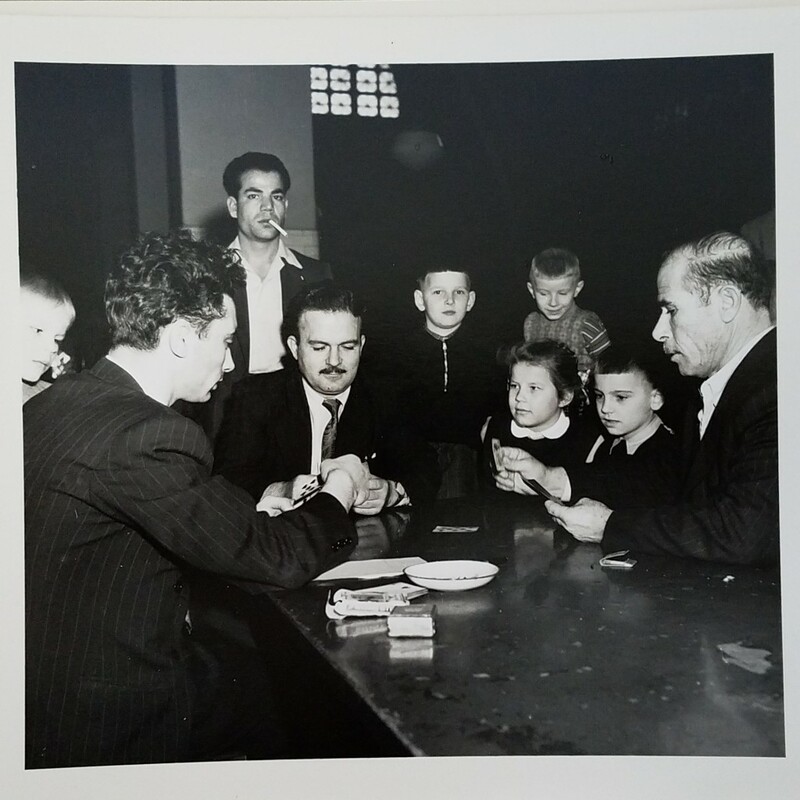 In 1951 she spent a day at Ellis Island, documenting newly arrived immigrants in various waiting areas. The titles of her photographs are basic—identifying what’s going on but without indication of the race or ethnicity of her subjects. Without those designations, the emphasis is on the profound commonality of waiting at Ellis Island, often for prolonged and nerve-wracking periods of time, rather than the differences among the people waiting there.